My Name Is Not Bob: Time to ESCAPE With Poetry: My Second Poetry Chapbook! Time to ESCAPE With Poetry: My Second Poetry Chapbook! I picked up 101 copies of ESCAPE from the printer yesterday, numbered them today, and will sign and ship them out tomorrow (to those who have already paid). The first review is already in, and Tammy says she loves the collection. I'm sure she's not biased. 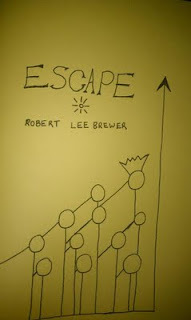 As with my first collection, ESCAPE is available only as a limited edition of 101 numbered and signed chapbooks. More than 50 copies have already been claimed. The cost is $10, which includes shipping to any and everywhere. 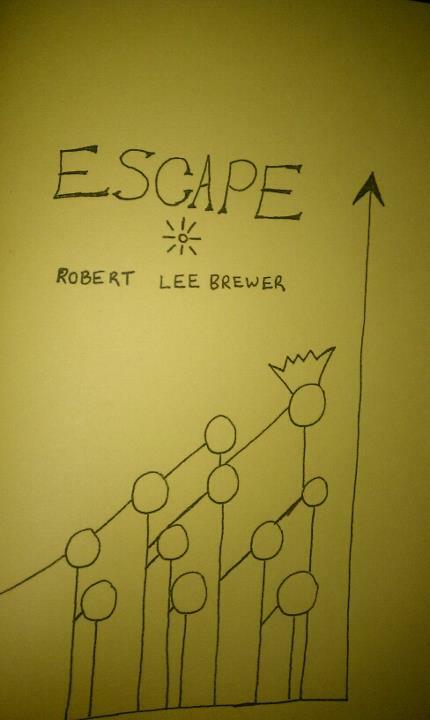 If you'd like to purchase a copy, just send an e-mail to robertleebrewer@gmail.com with the subject line: I Need an ESCAPE. The collection brings together a series of poems that I started writing last summer and finished at some point over the winter (for the most part). All 22 poems were written following the same very simple poetic form. It shouldn't be too difficult a mystery to unlock. Eight of the 22 poems found homes in publications, though my personal favorite did not. That's fine, I performed that poem often over the past year, and it always seemed to get one of the better responses from the audience. So it goes. Those familiar with ENTER (my first chapbook) will immediately notice that I tried to keep a little continuity with the cover design. All my covers have to be approved by a 7-year-old named Reese, so there you go. Anyway, I have some fresh copies of a brand new collection that will surely sell out ready to break out of the confinement of a cardboard box. Please help them make their escape. Connect with me on Twitter, Facebook, LinkedIn, Google+, and now Tumblr. Interested in self-publishing for yourself? Check out The Complete Guide to Self-Publishing , by Marilyn Ross and Sue Collier. Or better yet, find a copy of The Indie Author Guide: Self-Publishing Strategies Anyone Can Use , by April L. Hamilton. I think I was supposed to send a check a while back, but life took over and ambushed me- I will put one in the mail sometime tomorrow. Thanks, Andrea! I'll contact you today (been a busy Labor Day weekend). Call for Submissions: 2013 Songwriter's Market! Keeper League Confidential: Let the Season Begin!